Black Diamond Casino as Presented by Gambling World! 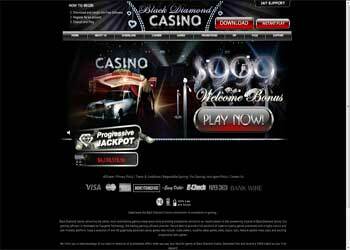 Although Black Diamond Online Casino originally opened during 2007 using Top Game, they switched to Rival Gaming Software during their early years, and then in the fall of 2011 they switched their gaming platform back over to use the Top Game software. Even those who were regular fans of the iSlots were rather impressed with the 3D graphics and the exceptional game play of the variety of slots from Top Game. Black Diamond has experienced quite a bit of growth over the years and they now boast of having over 75 games providing quite a bit of choice for gamblers. For those players that enjoy regular play at their favorite casinos you will find that the VIP Program offered at Black Diamond offers you many choices and benefits. All players start out as a Sapphire Lounge Member and based upon their level of play will progress from there to the Ruby, Emerald or Black Diamond Lounge levels. Each of the various levels offers frequent bonuses and promotions comparable to your level of play. In addition to the 200% first depositors bonus you can also get $25 free to try out the games in real mode. To qualify for the free $25 trial bonus, just download the software and create a real player account and the free bonus will be in your account to try out the games. With so much to offer and a free trial, why not download the software and create an account today! Visit Spartan Slots Casino Today!